When I was growing up, I remember my grandmother, Little Lil, always making soup on Monday. Regardless if it was 10 degrees out or 110, if it was Monday, we were having soup! One of her favorites was lentil soup. I was pretty suspicious of it for a very long time, didn’t try a bowl of it until I was probably 15. I instantly thought to myself, ‘Why did I waste all of those years NOT eating this! ?’ Lentils quickly became one of my favorite foods. Until I started cooking on my own, I only had them in soup. Now that I am experimenting with some new techniques and flavors I wanted to use of Korean Chili Flakes that a friend of mine gave to me. The results I have to say came out pretty darn good. 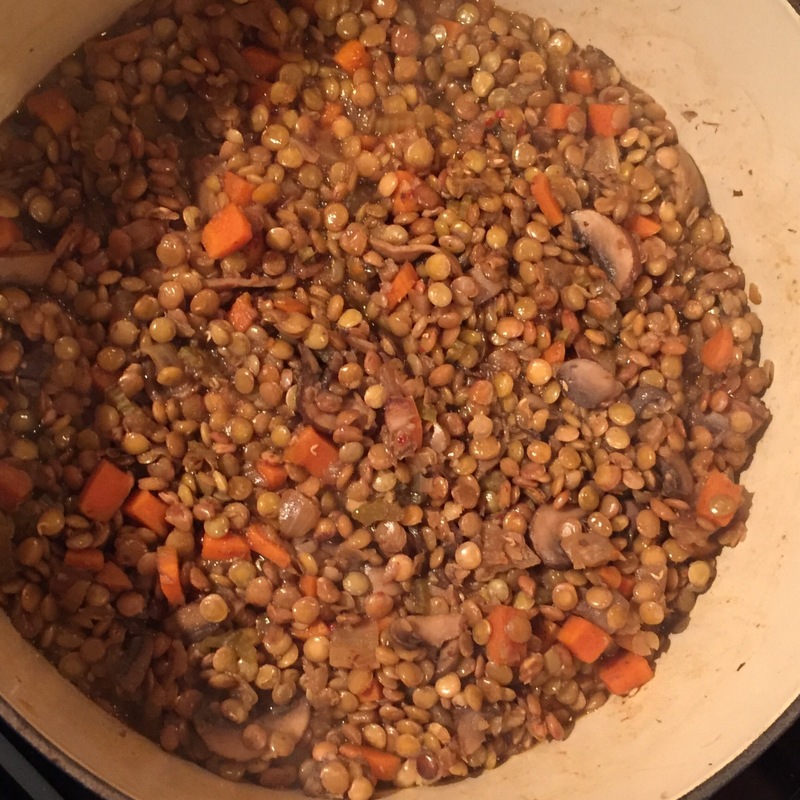 I was going to add some cooked rice and ‘beef’ crumbles that I had left over from another meal, but to be honest looking at the pot of lentils how good they looked and smelled – I decided to keep them out of the game! I use a heavy stock pot, heat it up and add a little avocado oil and let that heat over medium high heat. Sweat the onions first, I do this while I dice the rest of the veg. I like to get a bit of color on them without going full caramelized onion. Then add the sliced mushrooms and let them get some color to them, about 5. Then add the carrots, celery and garlic. Sweat another 5 minutes. Then I add the Tamari sauce, salt, pepper and Korean Chili flake and stir. Then immediately add the rinsed lentils and then the veg broth. Make sure you stir the bottom of the pot to get up any of that great browning or fond, that is a lot of flavor sitting there – make sure you capture it! Toss a lid on the pot and let simmer for a half hour. Lentils should still have their shape and still have a slight bite to them. Adjust cooking time longer or shorter depending on just how you like your lentils – also you can add some additional chili flakes if you want, but I find this style of chili tends to have more sweet overtones than heat. So have fun experimenting and I hope you enjoy the dish!